Bi Cities has put up the interview they did with Meg Barker when they were over at the first US BiReCon, and BECAUSE conference, earlier this summer. 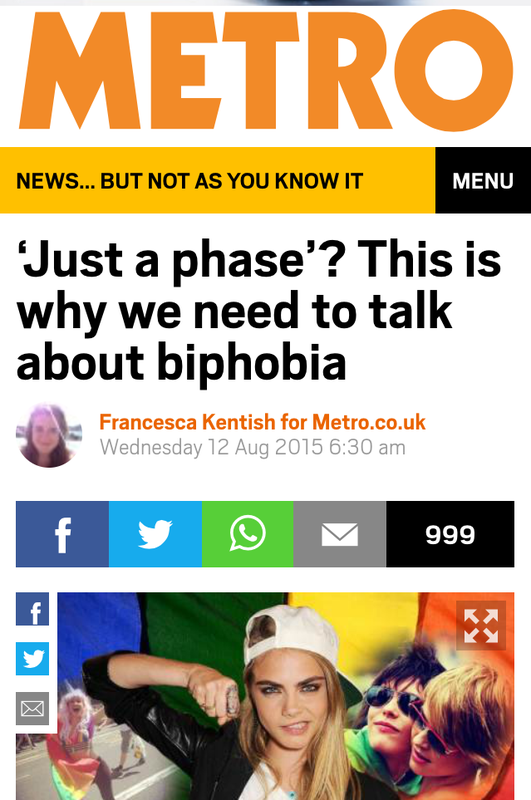 Meg talks about BiReCon, The Bisexuality Report, mental health, and more. The Bisexuality Report made the Kinsey Chronicles top 5 news stories of 2012. We now have a flyer of The Bisexuality Report for those who want a quick summary to read and/or to print and give out at events. The above version of the flyer can print as a 2-sided A4 sheet which folds into three for easy reading and inclusion into packs at conferences and events. This further version prints as A4 pages for each page of the flyer. As with the report please feel free to download these documents and disseminate widely. We now have a video of the launch event of The Bisexuality Report – with subtitles (thanks Jen!) Great to see speakers from the Government Equalities Office, Stonewall, and the Metro Centre commenting on what the report means to them. The Bisexuality Report: Out in Spanish! 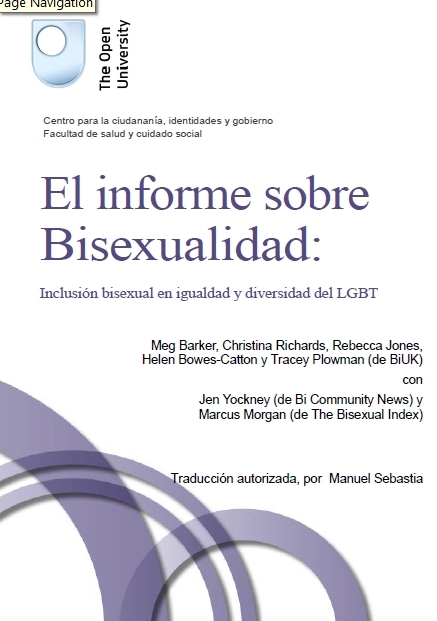 Thanks to the wonderful Manuel Sebastia we now have a Spanish translation of The Bisexuality Report. You can download El Informe sobre Bisexualidad, along with the original version of the report here. You can also access Manuel’s translation of our guidelines for researching bisexuality here. We hope that the translation proves useful and might prompt further discussion about the different situations of bisexual people and communities across the globe. We also welcome further translations of the report which we’ll happily make available through the BiUK website. The Bisexuality Report out now! 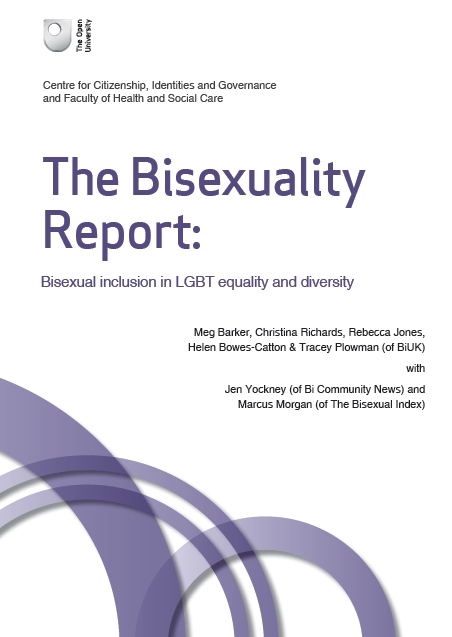 February 15th 2012 saw the launch of The Bisexuality Report in London and the document going live online (see the Open University website link, or the page for the report on this website). This will be followed by a Manchester event and discussion of the report at BiReCon 2012, later in the year. Here we want to say a bit about how we came to write the report, what it is all about, and where we go to with it from here. The first was the publication, in 2010, of the Bisexual Invisibility report by the San Francisco human rights commission. 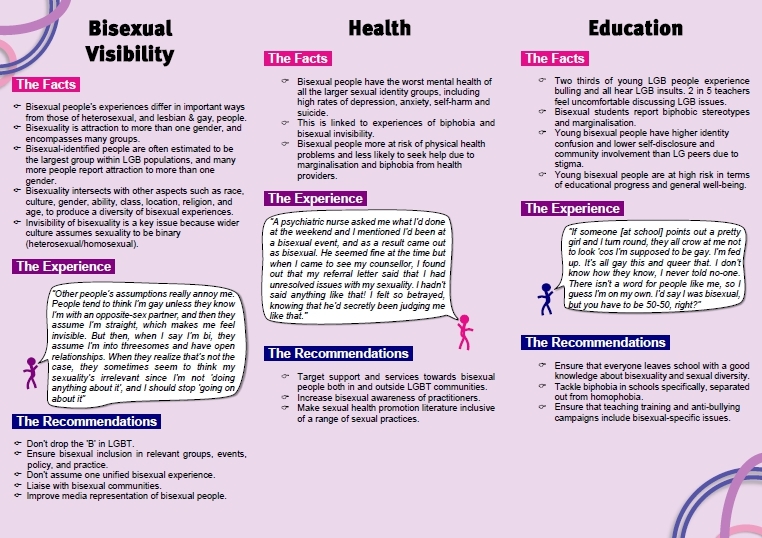 That document brought together the research on bisexual invisibility and biphobia, and their impacts, and drew out recommendations from this for policy and practice in the area. As the first of its kind, the report had an impact far beyond the area it was intended for, as it was circulated in online fora and many of us in other countries began to use it as a key source of evidence. Then there was a UK bi activist meeting in the summer of 2011 which many of the BiUK research group attended. As we were throwing around ideas about where the most valuable place to put our energies would be, Jen Yockney suggested a report similar to the San Francisco one, but with a specifically UK focus (two other main ideas to come out of the meeting and be acted upon since were addressing race in the UK bi community, and coming up with guidelines for researchers working on bisexuality). We realised that many of us were frequently responding to policy ideas, or media representations, or practices, by pointing out the implications for bisexual people. It would be much easier if we all had a document to point to which summarised why these things were important and what could be done about it. The final reason the report happened was that there is now a big enough group, with just about enough time and expertise between us, to put something like this together. We had the members of BiUK, together with Marcus from The Bisexual Index, and Jen from Bi Community News, so between us we had knowledge about the academic literature on different aspects of bisexuality, and the specifics of UK bi activism, community and experience. I knocked up a first draft, based on the topics we’d come up with at the weekend, and we passed that around the group, all adding the areas we knew about. On some of the areas we knew less about we got help from other experts (like Ian Watters and Surya Monro), or spent some time reading up the literature. The report itself is similar to the San Francisco report in focusing on the key areas of biphobia, bisexual invisibility, and the impact on health. However, we’ve managed to include specifically UK examples in all of these areas as well as international research. For example, we’ve included an updated version of our analysis of UK media depictions and how these often erase bisexuality by suggesting that people can only be gay or straight. We also spend some time in the report fleshing out the different groups who can fall under the ‘bisexual umbrella’. Diversity is a big theme in the report as we consider how issues may be different for different groups who may define (or be defined as) bisexual, and we also have a section specifically on intersections between bisexuality and other aspects of identity, background and practice (including race, gender, age, geographical location and several other aspects). A major argument of the report is that ‘B’ should not be always be lumped in with ‘LGBT’ because there are aspects of experience that are specific to bisexuality. But we are also saying that the ‘B’ itself doesn’t present one unified experience. 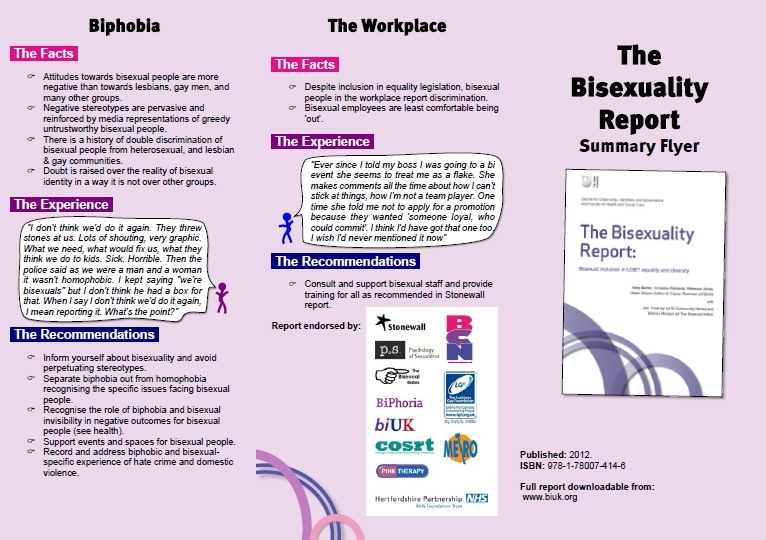 Another couple of things that are unique about the report are that it gives a sense of the bisexual communities in the UK – which are likely both similar and different to the communities in other contexts – and we also emphasise (at the end of the document) the positive aspects of bisexual experience. Despite the many challenges of being bisexual in a culture which generally doesn’t recognise bisexuality and which discriminates, being bisexual obviously brings rewards as well as difficulties. We were very lucky that a research study had recently been carried out on exactly this topic, including participants from the UK who we quote in the report. Once the report was written we ensured that there were plenty of brief accounts of bisexual experiences throughout, to bring the issues being covered to life for the reader. We also pulled out a set of recommendations for different areas (such as media, education, healthcare, and the workplace). And we wrote a summary at the start of the report to cover the main points. We were very fortunate that the Open University, once they heard about the project from the three members of BiUK who work there, offered to publish the report and to help us to publicise it. Once we had a final version we were happy with, Amandine Scherrer from the CCIG group at the OU, sorted out the beautiful design that we now have, and getting nice printed hard copies, as well as a pdf to make freely available online. Sarah Batt helped us to book accommodation and food for the launch, and several different groups within the OU provided financial support for all of this. Whilst this was happening, the authors approached various organisations we were in touch with to see whether anybody would be interested in endorsing the report. The results were amazing, and we are stoked that all of the following groups came on board as endorsers: Stonewall, the Psychology of Sexualities section of the British Psychological Society, The College of Sexual and Relationship Therapists, Pink Therapy, the Metro Centre, the Lesbian and Gay Foundation, and Hertfordshire Foundation NHS Trust. The final stage is the launch on February 15th, which the OU, Stonewall and the Metro Centre are kindly sponsoring. After that we will hopefully continue to promote to report online, and at various events, throughout the year. The Government Equalities Office will be attending the launch, and BCN, The Bisexual Index, and BiUK have already been speaking with them about how we can work together towards better bisexual inclusion in UK policy and practice. Hopefully we’ll be meeting twice a year from now on to develop some key practical goals which we can work towards in relation to this. It would also be great to provide more training once the report is out around these issues. Hopefully the report will be a good basis for bi community members to use for training in their local areas. It would also be great if other countries developed similar reports, drawing on what we’ve done with our report, and the San Francisco one. We’ve already been talking with some of the international bisexual community about a possible report for the International Lesbian, Gay, Bisexuality, Trans and Intersex Association (ILGA) to develop a report on bisexuality that was written for them, but not published, some years back. Obviously The Bisexuality Report will not be perfect. It was an attempt to produce something useful from the knowledge and expertise of the people who had the time and energy in summer 2011 to work together on this. There will inevitably be some areas which could be usefully developed or where we weren’t aware of all the evidence that is out there. Also, as politics and situations change over time, there’ll be a need to update the report to reflect the shifts in bisexual community and experience. As an online document it will be possible to update the bisexuality report every few years (as long as we have some funds for the design). So it would be great if people with expertise would volunteer to edit the relevant sections when we get to that point. Meanwhile, if there are sections of the report that people would like to elaborate on, it will be possible to put extra documents up on the BiUK website which go into more detail on various points. We would welcome any evidence-based input along those lines, and any responses to the report which we can put up on the website.